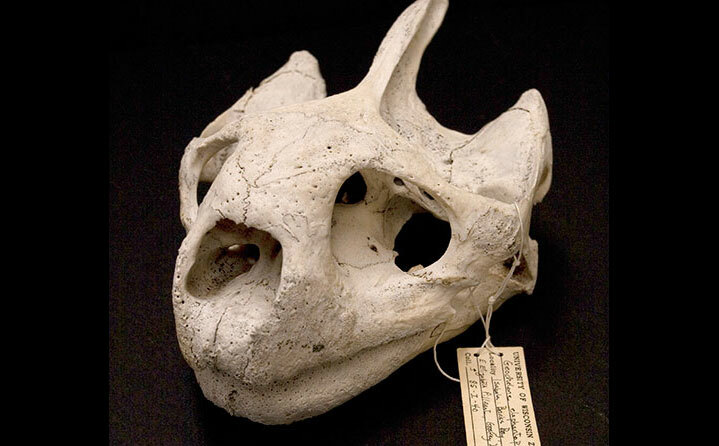 The Museum features an extensive collection from the Galapagos Islands, including this tortise skull. This is one of the United States most diverse and outstanding collections of complete skeletons. The collection contains nearly 20,000 specimens from all vertebrate classes. This collection is used extensively by researchers in zoology and zooarchaeology. 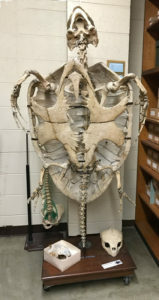 Galápagos – For over 40 years, the UWZM has been one of only a few institutions outside of Ecuador permitted to salvage specimens from the Galápagos Islands; over 1,300 specimens represent most vertebrates from the islands and are present as skeletons or preserved specimens. Dr. Craig MacFarland’s graduate studies instigated the collaborative relationship between the UWZM, the Charles Darwin Research Station and the Galápagos National Park. Subsequently, Craig served as director of the Charles Darwin Research Station (1974-1978) and president of the Charles Darwin Foundation for the Galápagos Islands (1985-1996). Use of and access to Craig McFarland’s Field Notes. Burton Purrington received his PhD in Anthropology from the University of Wisconsin-Madison in 1970 with a minor in Environmental Studies. He served as Associate Professor of Anthropology at Appalachian State University from 1970-1979 and then as Professor of Anthropology at Missouri State University from 1979-2002. He has applied his anthropology background to grassroots relief and development work in Haiti from 1997 to the present. Professor Purrington’s dissertation, The Prehistory of Delaware County Oklahoma: Cultural Continuity and Change on the Western Ozark Periphery provides a comprehensive background (through 1970) on the environment, archaeological history, artifact analyses and cultural units of Delaware County, Oklahoma. With permission, this important manuscript is made available to read or download here.